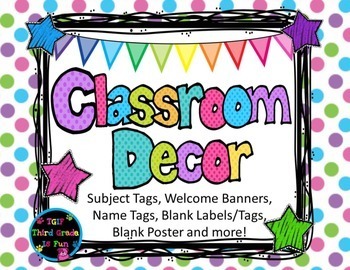 Classroom décor pack with bright colors to greet the students at the beginning of the school year. I use the subject tags/headers and blank templates/name tags all year long. 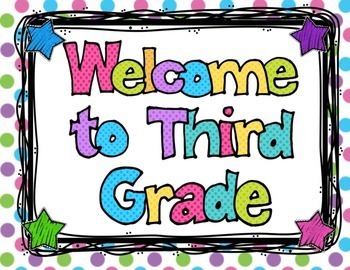 p. 3-11 Welcome to….. Kindergarten – Eighth Grade posters. If you have purchased this pack and need something different (e.g. Welcome to Music Class), just e-mail me at adial@akin091.org. 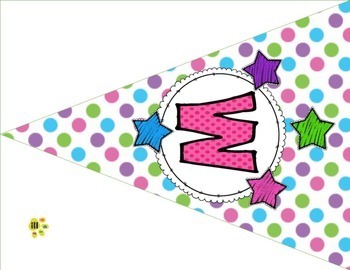 p. 12-18 Welcome Bunting Banner – Laminate, cut out and hang horizontally with ribbon or twine. p. 25-29 Blank templates and name tags. 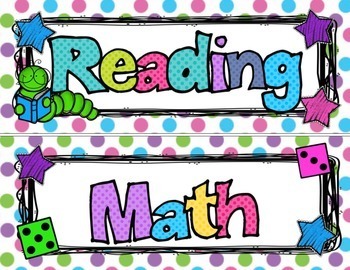 I laminate these and use them for temporary centers, short directions for groups, etc with a dry erase marker. I also write on them first, then laminate for tags for my supplies, book boxes, etc. p. 30-36 Circular Welcome Banner– Great for that skinny space right next to your door. Laminate, cut out, and hot glue ribbon between the letters so they hang vertically.